For 24 years I worked really long hours, often 14 hours a day. More often than not 60 hours a week. Always in Management, so not normally accruing overtime. If you asked me then "what does a stay at home Mum do?" I'd probably have thought "who cares?" followed by, if you pushed me for an answer: "they do lunch". But the reality is quite the opposite. In fact quite often, it gets to the time to leave for the p.m. school run and I realise I haven't had lunch. Even pregnant, I am often making this mistake. Today though, I was hungry early, so had 5 Weetabix and then didn't feel like lunch. That's not typical but I had a busy morning. So first off, today, Mums were invited in to make "sheep" costumes for the kids nativity. So that took from 08:45 a.m. to 09:30 p.m. Baby brain means I forgot to take a photo of our creation. 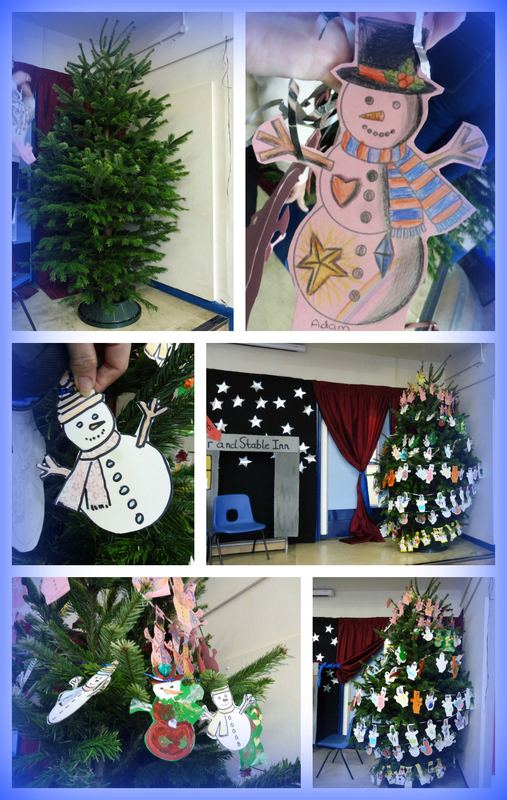 Then it was straight to the school hall to hole-punch and thread snowmen that could then form the garlands required to decorate our school tree. Except a class had popped into the hall to rehearse on the very same stage on which our tree was placed (that was another morning spent at school, Wednesday 25th November, the day we took the netting off the tree, errected it, screwed it into its water stand and let it fall open, wide and proud on the school hall stage). So we stayed at the rear of the hall, hole-punching and threading until we could get near our tree. By the time we could, we had to be quick, to get the tree finished before the dinner ladies would require the hall in order to set it up for lunch. Placing those garlands on the tree was harder than we expected, but there was 5 of us, so by just gone 11 a.m. we had it done. We left a couple of gaps as there are 5 more classes worth of snowmen to go on. The ones that don't fit will become bunting to make the hall look festive in time for school performances next week, and later on, during the final week of school, our Christmas school Bazarre. By the time I got home, it was midday, and then I guzzled my 5 weetabix, as normally after the school run I have a HUGE bowl of porridge, but I was too hungry to have the patience to make it, and not in the mood for lunch, despite having beautiful left overs from last night's dinner in the fridge. The time until I had to leave for school just flew by, so only 2 things on my to-do list got done, and it was time to get Aaron's pack lunch and sports kit ready for an evening of football. So I left home at 14:50, and we got home at 18:40. By which time there was only time to eat, before my 2 episodes of Coronation Street and 1 episode of Eastenders. I'm behind on a lot of blogging committments and being pregnant (no longer able to burn the midnight oil) and having busy days like this does not help, hence me doing a late night post tonight, in the hope that I bring this little corner of my life back into the limelight - a broken computer AND camera over the Summer and 8 weeks of morning sickness did not help either. I've just downed a whole 150g bag of salted cashew nuts in one inhale whilst typing up the above as the only thing I was in the mood for, when arriving home from football, was a sandwich. I am HOPING that I can do a couple of Vlogs over the weekend. One, as a pregnancy update, as the only ones I have done, are a video of my reaction to the pregnancy test and the morning of our 20 week scan. I was meant to do weekly Vlogs whilst pregnant yet I am 32 weeks' pregnant now - yikes. I would also like to do a Vlogmas Vlog although technicaly I ought to have started that on 1st December - oooops. Bad blogger, bad vlogger. The good thing tonight was, after a whole week of school and a very busy day today with football tagged on, Aaron was very tired so all he wanted to do when he got in was lie on the floor, line up some of his cars, whilst watching Sofia on Disney Junior and then eat/chill. He was asleep in bed as early as he would be on a school night. Hence I guess I am relaxed enough to be sat here blogging with one eye on The Graham Norton Show as I type this, instead of falling into bed shattered. Aaron's only got 2 weeks of school left in 2015 and then it'll be flat-out Xmas followed by newborn, so I have 9 working days in which to catch up on a hell of a lot, if I am going to be relaxed enough to have this baby. Unlike the whole online world who had their decorations up by 1st December, ours are still in the attic, so the next fortnight is going to be insanely busy, and I am not sure I am up to it. I think I will be powered by Pregnacare to be honest. Yep, I won't take offence if you say I look like I am having twins. I definitely look full term already. But then again, at the 25 week 4d scan, baby was measuring on the 94th percentile (just like her brother before her) so I think I will have another over 9 pounds baby on my hands. Oh, by the way the 8 foot Nordman Fir tree above is from Pines and Needles, who I would like to say thank you to. Wow - that bump! I had always thought sah moms must just live the life of riley but having been a part of my sister's life I can testify that she hardly has time to sit down! Oh gosh! You have been so busy!! I think in December real life has to come before blogging or you will just wear yourself out. You look fabulous in that pink frock! Don't beat yourself up about not doing as many vlogs as you would have liked - aim for quality not quantity. It sounds like you have so much going on - remember to take it easy and look after yourself!! I have 3 kids so know how hard it is to make time for yourself, but I hope you find it. I love the tree with all the snowmen, brilliant! The day just goes so quickly doesn't it? I'm sure an hour lasted longer when I worked in an office! Wow now that is a bump, definitely full term I would have said! You look fab - I love your outfit. Try and rest though, and eat something! You look amazing. It's so easy to get caught up in things that the time passes by, espeically at this time of year. Those snowman garlands are fabulous! And... five weetabix?! Wow, that's impressive! !